Are Stocks Sending Us a Message About Economic Growth? There has been considerable debate lately about whether the economy is strengthening or continuing to sputter. Data can be cited to support either case. Perhaps we can get some clues by looking at the performance of various market sectors. For our purposes, sector performance is perhaps most meaningfully illustrated by relative strength price charts. Relative strength charts do not track the absolute price movements of a stock but the price movement of the stock compared to the price movement of another stock or index. If the price of a stock is outperforming the S&P 500, for example, its relative strength chart will be moving upward, even if the price of the stock is going down. All that matters is how the stock is doing relative to the S&P 500. 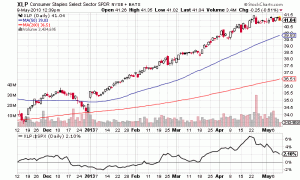 The charts of exchange traded funds (ETFs) that track the movements of sectors provide us with the easiest way to see how certain sectors are doing compared to the S&P. Over the past few weeks, the relative strength lines of ETFs that include companies from economy-sensitive sectors and industries, such as basic materials, trucking, ocean shipping, energy, homebuilding, and technology, have turned upward. 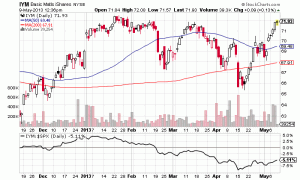 These companies, also called cyclicals, historically tend to do well when the economy begins to expand. On the other hand, the relative strength lines of sectors that generally outperform in a weaker economic environment have recently turned downward. Among these defensive sectors are consumer staples, utilities, and healthcare. Figure 1 shows the chart of an example of an economy-sensitive ETF, the Basic Materals iShares, which includes companies that make products used in industrial applications. As you can see by examining the relative strength line (the solid black line at the very bottom of the chart), the basic materials sector has been in a long downtrend versus the S&P since the beginning of the year. But the decline has, at least temporarily, reversed. Since April 15, the relative strength line of the basic materials ETF has been going up. 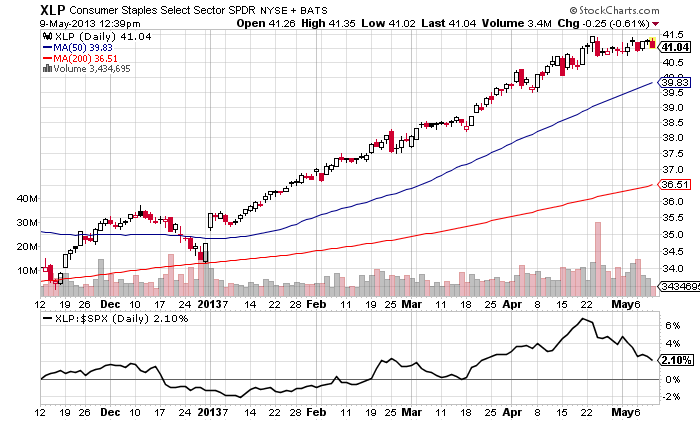 Figure 2 uses a chart of the Consumer Staples Select Sector ETF to illustrate the recent change in relative strength of defensive stocks. As the solid line at the bottom of the chart shows, the strength of this ETF relative to the S&P has been in decline the last three weeks after rising most of 2013. Included in the consumer staples sector are stocks of companies that make food, personal, and household products. These products are usually purchased by consumers regardless of the economic environment. As a result, the companies that manufacture these products generally outperform during tough economic times but underperform as the economy turns around. The relative strength charts of other defensive sectors look very similar to the one below. Some analysts do not believe that these recent relative strength changes are meaningful. They argue that the price action in these sectors simply reflects a correction of valuation differences and is not forecasting an economic upturn. The strength in basic materials and other economy-sensitive sectors, they argue, will be short-lived. But the changes in the relative strength of economy-sensitive and defensive stocks should not be ignored. Because they generally occur before the changes in the economy become apparent, they can be valuable forecasting and investment strategy tools. We will be keeping our eyes on these stocks in the coming weeks.